Dietary fats and other constituents have been studied extensively in relation to breast cancer risk. Iron, an essential micronutrient with pro-oxidant properties, has received little attention, and specific fats may augment its toxicity. We investigated the effects of iron and fats from various food sources on the risk of breast cancer. Participants in a population-based case–control study, 3,452 breast cancer cases, and 3,474 age-frequency-matched controls, completed in-person interviews, including a detailed food-frequency questionnaire. Plant- and animal-derived iron and fat intakes were derived from dietary intake data and food composition tables. Unconditional logistic regression models were used to study the independent and interactive effects of different forms of iron and fats on breast cancer risk. 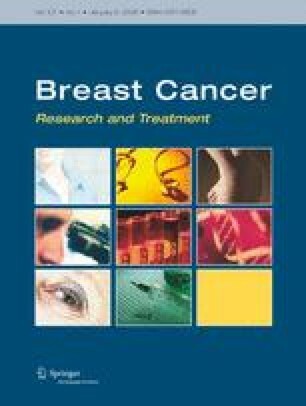 Animal-derived (largely heme) iron intake was positively associated with breast cancer risk (P trend < 0.01; OR = 1.49 in the highest vs. lowest quartile, 95% confidence interval [CI] 1.25–1.78) after adjustment for known risk factors, antioxidant vitamin and isoflavone intake, and vitamin supplement use. The effect of animal-derived iron was similar in pre- and postmenopausal women. Intake of animal-derived fats was also associated with increased risk (adjusted OR = 1.34, 95% CI 1.14–1.58), particularly after menopause. A significant interaction between iron and fat from animal sources was observed (P < 0.01). A high intake of animal-derived (heme) iron may be associated with an increased risk of primary breast cancer in Chinese women, and saturated and mono-unsaturated fats that are also derived from animal sources may augment this effect. Combined reductions in animal-derived iron and fat consumption have the potential to reduce breast cancer risk. We gratefully acknowledge the patients and research staff who participated in the Shanghai Breast Cancer Study. We also thank Dr. Hui Cai for his analytical support. This work was supported by the Office of Research in Women’s Health via a National Institutes of Health Mentored Career Development (BIRCWH) Award to Dr. Kallianpur (5K12HD04348-04) and by USPHS Grant R01CA64277 (Dr. Zheng).